Mobile internet hotspots are now available for check-out at the library’s Melrose and West Oakland branches. The hotspots—small, portable devices which provide wireless internet access to smartphones, tablets and laptops—can be borrowed for up to three weeks by any library cardholder. The program arrives after presidential candidate Hillary Clinton set out her vision to connect every household in America to fast, affordable broadband by 2020. In her June policy initiative, Clinton underscored her commitment “to harness the power of technology and innovation so that it works for all Americans” in order to create well-paying jobs across the country. 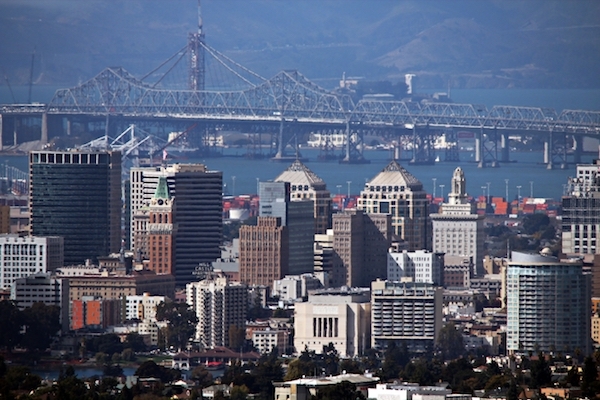 The hotspot lending program has already proved popular with Oakland residents. One week after the program’s start, almost all of the 45 hotspots had been checked out. Special projects librarian Mary Schrader said students in West Oakland have been borrowing hotspots to complete their homework, and others have followed after hearing about the service from their friends. Some of those students “hadn’t been into the library for quite a while,” Garzon said. “I think people forget that libraries have really widened the types of services that we provide.” The unlimited broadband provided by the hotspots allows for endless browsing, and access to all services delivered on the internet. “They can check newspapers at home, they can do their studies, they can check a book review, they can buy something, they can even watch a movie,” Garzon pointed out. While the program was primarily intended to serve Oakland’s young people, other members of the community have also found it to be a valuable resource. Social worker Karen Denicore was thrilled to find the service would be available to the low-income seniors she works with. “Right away I was like, ‘Oh my God, the need is going to outstrip the capacity almost immediately,’” she said. For low-income seniors, spending over $40 a month on home internet access is often not a priority. But Denicore believes this could be costing many their independence and close relationships with their family members. “The way the world works right now, having internet is not a luxury,” she said. “Without the internet, seniors don’t have access to basic services.” She feels access to the internet should be considered a utility, like water and electricity. Denicore believes that, for many elderly residents, it’s a lack of access—not a lack of internet literacy—that prevents them using the Web. Accessing services like bank statements and housing applications online from home can help preserve the independence of those living in old age. The idea that seniors can’t keep up with a generation of digital natives, Denicore said, is wrong. In fact, seniors are eager to use the Web to stay in touch with family members. “I work with a lot of immigrants, and these folks are hip to Skype, man. They’re chatting it up with their families back in Russia and China, and maintaining their family relationships using the internet,” she said. Grandparents, especially, are looking to get online. “It’s sort of impacting the relationship,” Denicore said. “The [grand]kids don’t come to visit as much, or they can’t come for the weekend because they have homework to do and they need the internet.” With high-speed wi-fi at grandma’s house, Denicore’s believes kids will be able to connect more easily with a generation that saw the invention of color TV. Oakland’s hotspot lending program has been funded for the coming year by the Friends of Oakland Public Library. While Garzon looks for another sponsor, he hopes the scheme will benefit the city’s most disadvantaged residents. “Even though we only have 45 of these that we can check out, we’re trying to equal that playing field for some of our people out there,” he said. If a new sponsor is found, he hopes to expand the program to the library’s other branches, bringing the service to more Oakland neighborhoods. Oakland residents can now check out internet hotspots from Oakland Public Library’s West Oakland (pictured) and Melrose branches. Photo by Rosa Furneaux. Oakland residents can now check out internet hotspots from Oakland Public Library’s West Oakland and Melrose branches. Photo by Rosa Furneaux.